Gross Weight (GVWR) 12995 lbs. 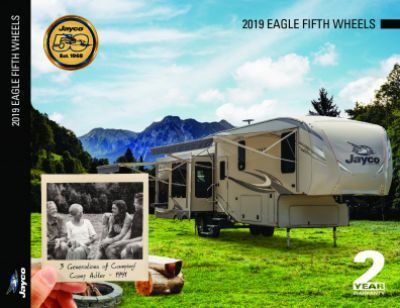 At Tradewinds RV Center, we sell the nation's leading RV brands at sensationally low prices, so if you dream of owning the 2020 Jayco Eagle 319MLOK 5th Wheel, come see us! We're located in Clio, Michigan and our friendly, knowledgeable staff will show you how to save $1000s on this terrific RV. So stop in at 4325 W Vienna Rd Clio Michigan 48420 and let us make your dream come true! We've got great financing and 24/7 door-to-door delivery, so even if you don't live in the Clio area, you can call us at 810-686-0710 and have this great RV in your driveway in no time! Your outdoor fun is limitless in this 36' 11" long, 8' 0" wide 5th Wheel, thanks to its towable hitch weight of 2150 lbs. and a GVWR of 12995 lbs! You'll enjoy hours of fresh air and outside relaxation under the 17' 0" patio awning that opens easily and protects your family from the sun's UV rays or the rain! Steaks, hamburgers, flapjacks, soups - you'll cook them all, and more, for family and friends on the modern, 3 burner cooktop! You'll also love the roomy 8.00 cu. ft. refrigerator that will store all your favorite fresh foods and cold drinks so they're always handy! Clean up the dishes in no time with plenty of hot water from the generous 75 gallon fresh water tank and the LP tank capacity of 60 lbs! 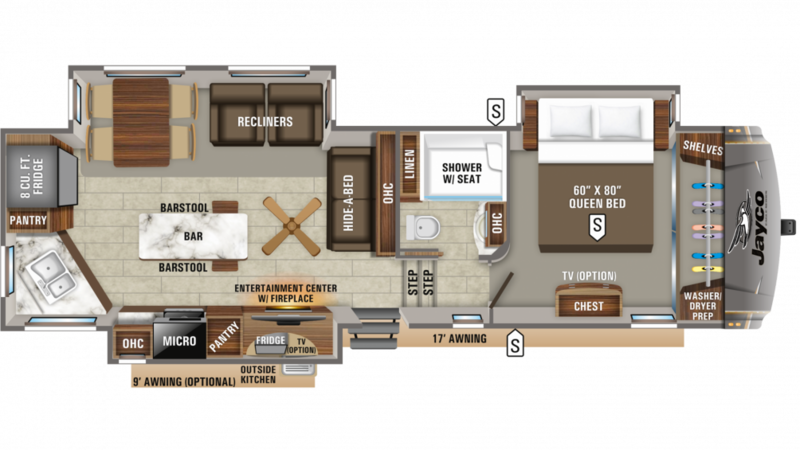 There is a Porcelain Foot Flush toilet, sink vanity, and a shower inside the full bathroom of this grand RV! With its 60 lbs. of LP tank capacity, your family can enjoy long, hot showers all vacation long! The 87 gallon gray water tank and 50 gallon black water tank store all the used water and waste, preventing nasty bathroom-related problems! You'll love the outdoor kitchen! It's easy to open and you'll whip up delicious, fun meals for everyone anytime you please! Great for picnics and tailgating!